Multiple languages and lack of linguistic skills and expertise, especially in Middle Eastern languages. Entities in charge of territories security more than ever need to have efficient multilingual intelligence capabilities of OSINT and COMINT. 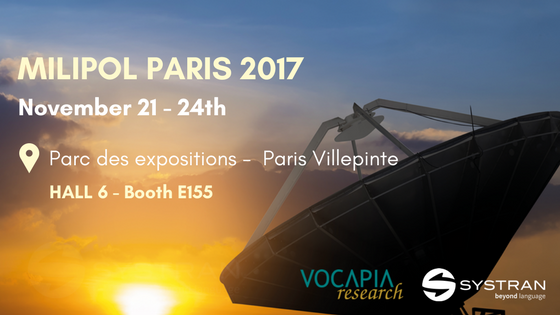 On November 21-24th, SYSTRAN will be participating in the MILIPOL event in Paris in partnership with VOCAPIA Research. MILIPOL Paris is the leading event for homeland security and is organized under the patronage of the French Ministry of Interior. As the leader in language processing technology, SYSTRAN launched in 2016 the first Neural Machine Translation technology able to provide intelligence professionals with a secure automated translation solution available in more than 140 languages pairs with an outstanding quality for languages as Arabic or Chinese for example. Our partner, Vocapia Research, develops leading-edge multilingual speech processing technologies to enable speech recognition, automatic audio segmentation and much more. We will be showcasing our Real Time Text & Speech Neural Translation solution and hold DEMO sessions to show you how we integrate into your internal processes to seamlessly manage multilingual projects. We therefore invite you to stop by our stand (Hall 6 n°E 155) to check out our solutions and discuss about how we can bring true value to your organization. Emmanuel TONNELIER, Director of Defence & Intelligence Solutions at SYSTRAN will be one of your main contact there. Please feel free to get in touch with him before or during the event to arrange a meeting onsite. This entry was posted in AI Translation, Events, Neural Machine Translation, SYSTRAN PNMT, Translation and tagged Artificial Intelligence, Border control, counter-terrorism, Homeland Security, Multilingual COMINT, Multilingual OSINT by Gaelle Bou. Bookmark the permalink.